Students who are home schooled or from a school that is not accredited by the Illinois Board of Higher Education will be required to submit transcripts from the organization/program through which they obtained their materials for home schooling. Based on their educational history, students have different requirements in regards to what official transcripts are needed to complete an admissions application. Official transcripts are defined as being delivered via a secure electronic provider (such as Parchment or Credentials) or in a sealed envelope from the educational institution. A transcript turned in by a student is only considered official if it is still in the sealed envelope provided by the educational institution. Demonstrated readiness or ability to successfully complete college level coursework as demonstrated through high school grade point average, college grade point average, and SAT/ACT scores. * Higher GPA may be required for some programs. Please refer to department specific admission criteria in the Academic Division of the Catalog. Transfer students must provide official transcripts from each college or university attended. 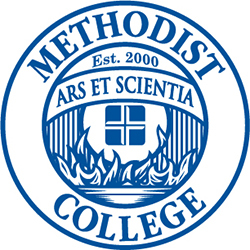 Students who have been academically dismissed from another college/university may not eligible for admission to Methodist College pending further evaluation by the department. admission or enrollment status at the college. Admission to Methodist College is very competitive and all academic factors are considered in evaluation of applications. To be most competitive, students should strive to achieve the highest academic scores (ACT/HS GPA) and achieve grades of "A" or "B" in English, Science and Math courses. The Methodist College Second-Degree Accelerated BSN is designed for those who have earned a bachelor's degree in a field other than nursing and wish to become a registered nurse. In addition to a strong academic background, to be considered for admission to the RN to BSN program, you must submit records showing completion of a diploma or Associate's degree from an accredited nursing program and must currently hold a valid RN license. Students seeking admission to one of our Master of Science in Nursing degree programs must have a current unrestricted license to practice as a Registered Nurse in Illinois and have earned a cumulative GPA of at least 3.0 on a baccalaureate degree or cumulative GPA of at least 3.0 for the last 60 hours of baccalaureate studies. The Medical Assistant Program at Methodist College will lead to a certificate and prepares the graduate for certification. In addition, the Medical Assistant curriculum at Methodist College is designed to create a pathway to the Bachelor of Science in Nursing degree as some courses may be transferable to the pre-licensure program. The Gerontology Certificate program prepares current and prospective personnel within the health care and human service sectors to provide services appropriate for an increasing population of aging clients.